On one of my frequent visits to the library, I picked up a book with a picture of a squinting boy on my way to check out. 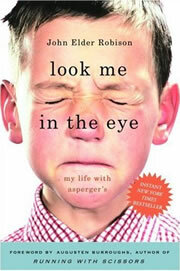 The title read “Look Me In the Eye, My Life with Asperger’s”. I went home and started reading it. I saw that it was written by John Elder Robinson, brother of the writer of “Running with Scissors” which I happened to watch a few months ago. I read “Look Me in The Eyes” in a couple of days days. I was fascinated. I felt the need to watch the movie again, which I did the next day. It was a much different viewing this time now that I understood that whatever these brothers wrote were their true life stories. I went to the library and picked other books by Augusten Burroughs. I was listening to “Possible Side Effects” while I drove to the gym and to my clients, and read “Magical Thinking”, “Dry”, “Sellevison” and “Running with Scissors” which was much more detailed, more ragged and shocking than the movie. I am fascinated by the way they told their stories and the way they survived a dysfunctional family and a really strange childhood. I am also amazed by the way they see the world, and their story telling abilities. The books also work as a great “memoir writing” crash course if you pay attention the way they write. Simple, fascinating and absorbing. You might remember me talking about going to an Arts class last year. I was very excited at the beginning, and very happy with the teacher who seemed to understand what I was trying to accomplish. Three weeks later, I started thinking that I was in a Twilight Zone because the sweet old gracious lady transformed into a bitter old woman who started yelling at everyone about what they were creating. I realized that she was more cruel and unforgiving to the new students. I was shocked about the way she insulted us. And I stopped going to the classes after the first 6 week session ended. So instead of getting my inner children encouraged, I got them beaten up! I knew her behavior came from her own frustration with herself. So I did not give up. I didn’t look for other classes but I found other ways to make my children happy! I started playing around with a digital creative arts program, and I enjoy it. The paintings come out similar to oil painting, and there is no mess, and it is faster- goes with the way I like doing things. I saw something I needed to share with you. See my picture to the right. I opened this picture in a photo program I described in the previous article above. Then I changed it by using one of the effects, which is called Sandstone. What I saw was very interesting! I was interviewed by Luisa Rasiej as a guest expert for her brand new weight release program, “Sculpt Yourself New: A Weight Release Program through Body, Mind and Spirit. Initiated by Luisa, and collaboratively designed by several women experts, Luisa’s program combines a variety of modalities, while offering her participants a number of tools to use while they are going through the program. My expertise covers the clutter’s effects on our body, including the other end of the spectrum with obsessive and over-organizing, which causes the nervous body and unhealthily thin bodies. 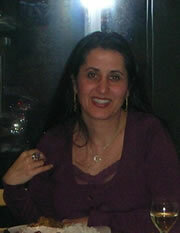 While raising consciousness about the environment, I also offer solutions with energy nutrition. On this interview, I spoke on how our environment effects everything we do, and how to address the likely drawbacks. I talked about the possible adverse effects of clutter and disorganization on a person’s weight and eating behaviors, including the extreme organizing, nervous body and from aspects of Feng Shui and how to address the emotions on the way to the targeted weight applying EFT, energy modalities, Feng Shui and organization. When the interview becomes available, it will be posted on my website. There is an owl on my tree. Perfectly shaped, two amazingly equal, rounded eyes, a small upturned nose, a mouth saying something, and tucked in wings. 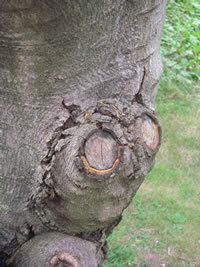 I discovered him last summer, when I started climbing trees again during Project Sanctuary training! He is on the tree right across from my office window; however I have to go outside to see it because it is on the other side of the tree. You can see the window at the background. What is in your tree?